UCL Occupation | We are students occupying University College London in protest at fee rises and cuts. We are students occupying University College London in protest at fee rises and cuts. Kat Craig of Christian Khan Solicitors represented UCL students Sarah Crane-Brewer and Frank Harris in possession proceedings brought by University College London (UCL) management at a hearing in the Central London County Court this afternoon. In a judgment handed down by Her Honour Judge Faber this afternoon, UCL were granted a possession order for the Jeremy Bentham Room and part of the Slade School of Fine Art, which have been occupied by students since 24 November and 30 November respectively. 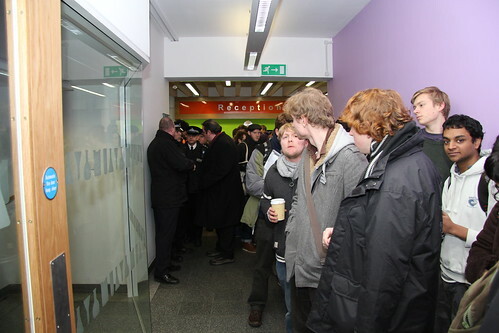 However, the students successfully defended a claim for possession over the entirety of UCL’s Gower Street campus. Whilst the students’ argument that the attempt to end the occupation interfered with their rights under Articles 10 and 11 of the European Convention on Human Rights which enshrine the right to freedom of expression and freedom of assembly and association, was not accepted by the Court, Her Honour Judge Faber granted leave to appeal on the issue. She held that, were the appeal to be successful, the order for the Slade School occupation may not have been justified. The Judge acknowledged the occupation’s aims of providing a safe space for UCL students to protest against the rise in tuition fees and the 80% cuts to the teaching budget, with Arts and Humanities courses facing the complete removal of government funding. Many students have been deeply concerned that public protests are no longer safe as a result of police violence and pre-emptive kettling. 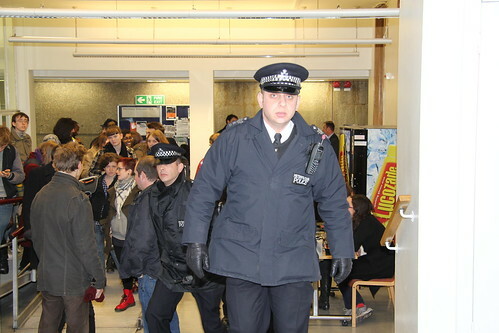 The occupation also demanded that the London Living Wage is paid to all workers on campus. Ms Craig who, together with barrister Liz Davies, is acting pro bono for the students said: “These young students have been very brave in putting themselves forward to help the Court determine an important point of law. The Judge today paid tribute to both parties for their enlightening arguments and commended all parties for the sensible way in which they have conducted themselves. A small group of the UCL Occupation decided to go for a cup of tea at a lovely cafe that happens to be adjacent to the constituency office of the Liberal Democrat MP Simon Hughes. For some reason the London Metropolitan Police decided to have an armed guard of police in a riot van watch over and observe us while we sipped that most British of drinks, the innocent cuppa. Simon Hughes MP, seen by many as the totem of the Liberal Democrat left, and a champion of civil liberties, justice and the neccesity of public participation for a healthy democracy was not available for comment. We feel that such events as chronicled in a Flickr photoset available here are indicative of arguably the most ILLIBERAL government response to direct action and genuine, grassroots political mobilization in the history of contemporary British democracy. Students, schoolchildren and unionists are finding their rights to freedom of expression, association and protest being compromised on a daily basis. The Liberal Democrats, a party whose election manifesto and political posturing has been seen as broadly championing the causes of personal freedom, now constitute a sizeable part of a government that represent the biggest threat to the values of British democracy and the curtailing of liberty in our lifetimes. While we drank tea on a cold evening in Bermondsey, the police waited outside Hughes’ office (two on the door and a further six both in and in front of the police van) with what we recognized on their persons as CS gas. The champion of the Liberal left, the previously erudite and independent Hughes is now it seems an integral part of a government and policing establishment intent on systematically dismantling our constitutional rights , enshrined in both British and European law, to freedom of association and movement. Within the Student movement we wish to pose the following questions to Simon Hughes MP, a figure who until recently commanded a great deal of respect as a member of the progressive left and frequent champion of personal liberty. Is this the sort of country you want us to become? Furthermore,is this the country you have sought to build since winning parliamentary office to Southwark in 1983? 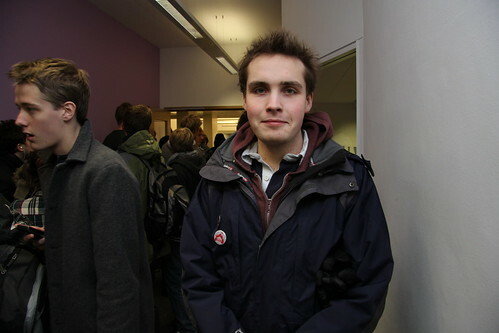 We within the student movement feel or rather hope that the answers to both questions would be a resounding no, and that Hughes, who for much of his career has been a politican of immense integrity, feels trapped by the backroom politicking of this ramshackle and undemocratic coalition government. Our message to Hughes then is this. While you stand in alliance with this government and retain faith in Nick Clegg as the leader of the Liberal Democrat party in the House of Commons, you are undermining the democratic fibres of our country and an 800 year old tradition of liberty that has been at the heart of our body-politic that preceeds conjtemporary party politics. 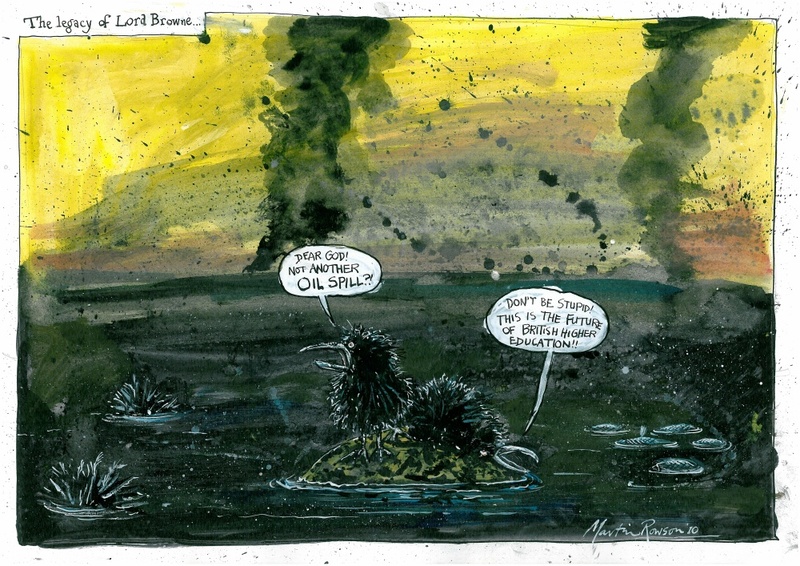 You undermine something sacred and much older than either the Tory or Liberal parties. While you stand in alliance with this government and retain faith in your party leader, you are not only legitimizing and contributing to the systematic dismantling of our country’s democratic traditions, but also it’s hard won and venerable public institutions including universities that have until recently offered higher education available to all on the principle of merit and not money. Subsequently our message to Hughes is this. On looking at the pictures of teenagers and early-twenty-somethings drinking tea under the close scrutiny of the police do you really believe that this government is tenable for five years? Are you satisfied that it seems an empirically observable fact that the longer this undemocratic and haphazard government rules, the closer we seem to move towards becoming a police state? This is not story by Kafka or Borges – as surreal as employing surveillance over individuals drinking cups of tea might appear – this is the tragic and unfolding story of our country and what this government, of which are a member are doing to it. This movement is intent on reversing this pattern and taking our country back, inch by inch if need be, and we implore you to do the same. If you are that same progressive politican of integrity that we remember before May 6th of this year we invite you and your fellow Liberal Democrat colleagues in the House of Commons to start on Thursday evening by joining us and representing the wishes of your own constituents in Southwark by voting against the propsed reforms to higher education and the EMA in England. The result of the Extraordinary General Meeting… we won! This was a bit of a bittersweet victory. Many people who came were unable to get in due to the limit of the room booked. A student-body wide referendum will be held within a week on whether to uphold the motion, as it should be, in order to gauge the feelings of the whole student body (or as many as will vote), but as it is… we’ve officially got UCLUnion support by a substantially large majority! Calling all UCL students, join us at the Christopher Ingold Chemistry Department (opposite the Bloomsbury Theatre) right now to vote for UCLU to support the occupation. Photos from the queue so far below. More information to follow soon!